Ink-a-Doodle Creations: Sprinkled with Contraband!! Good morning, today I am over at Stylin' Stampin' INKspiration and we thought we'd share a special non-traditional post with you. It's "Contraband" day. As you may know, SSINK is a blog that is 100% Stampin' Up!, but well some of us designers do like to play with our toys too. So today we wanted to share projects using some of those other toys. One of my little sins, is My Favorite Things. They do have some really cute stamp sets with matching dies. 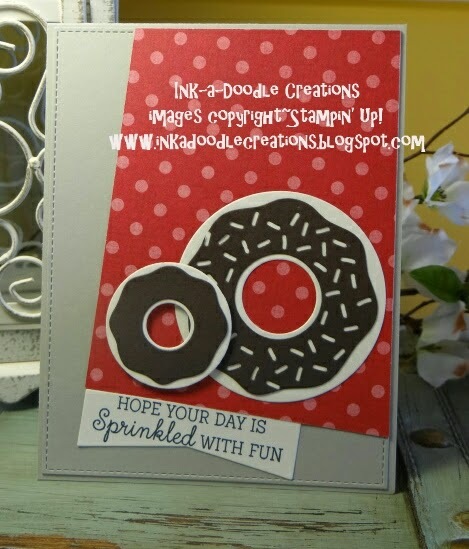 One of my recent purchases was this cute little donuts and sprinkle stamp set and die set. I also used one of the blueprint die sets they offer too. I hope you have enjoyed my contraband challenge card. Leave some "love" and go see what the other designers created.